1/3 pound block chocolate or bars in large pieces (about 4” don’t use small pieces or crumbs). Most chocolate you buy in a retail situation is tempered chocolate. Melt the chocolate (see notes). Dark chocolate needs to be at least 115° F degrees to insure that all the chocolate is melted. Milk or white chocolate needs to be at least 110° F degrees to ensure that all the chocolate is melted. Remove chocolate from heat. Once the chocolate is melted, add the block chocolate pieces to the melted chocolate and cool the chocolate by stirring periodically with the spatula and using your digital thermometer to check the temperature of the chocolate. It will take 10 to 15 minutes. Once the chocolate mixture reaches 90°F degrees, remove the pieces of block chocolate that are not melted. 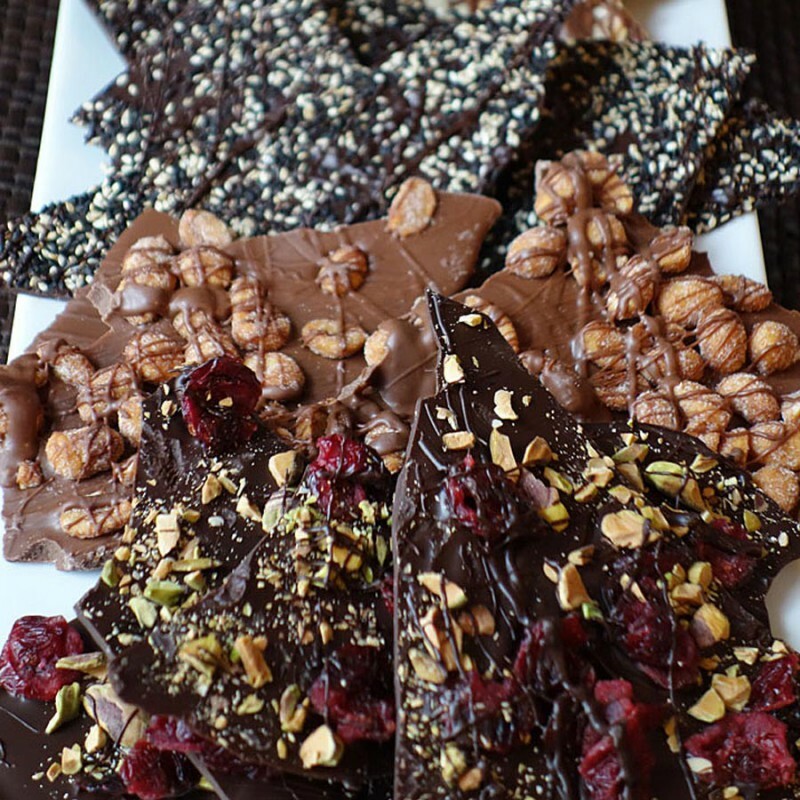 You can reserve them as seed chocolate for your next chocolate tempering session if they are large enough or chop them up and melt them as your next base chocolate. Continue to stir and cool the chocolate to 88°F degrees for dark chocolate and 86°F degrees for milk or white chocolate. Once you reach the desired temperature, make your chocolates and place them on prepared trays. Snap cool your chocolates for 5 minutes in the refrigerator and then cool at room temperature until hard. Store chocolate in a cool place. Oven - Toaster Oven Method: Preheat oven to lowest temperature (mine has a WARM setting). Place chocolate in a stainless steel bowl. Heat, stirring at 5 minute intervals. When chocolate is 75% melted, remove the bowl from the oven and let chocolate melt from residual heat. Double Boiler Method: Place chocolate in the top of a double boiler or in a stainless steel or heat-proof bowl over a saucepan of just simmering water. The upper pan or bowl should not touch the water. Stir with the spatula every few minutes. When chocolate is 75% melted, remove the bowl from the heat source and let chocolate melt from it’s residual heat. Microwave Method: Place chocolate in a glass or microwaveable bowl. Microwave at 2 minute intervals at 50% power for dark chocolate or 2-minute intervals at 30% power for milk and white chocolate. Stir chocolate with the spatula and measure the temperature of the chocolate between each interval. When chocolate is 75% melted, remove the bowl from the microwave and let chocolate melt from it’s residual heat. While making your chocolates you keep the tempered chocolate warm so it stays tempered. Place the bowl of chocolate on a heating pad set to low and stir to keep chocolate in the temperature range as needed. Place the bowl of chocolate over, not in, a bowl of warm, not hot water and stir to keep chocolate in the temperature range as needed.